Ready-to-Cook Meals Delivered to Your Door! 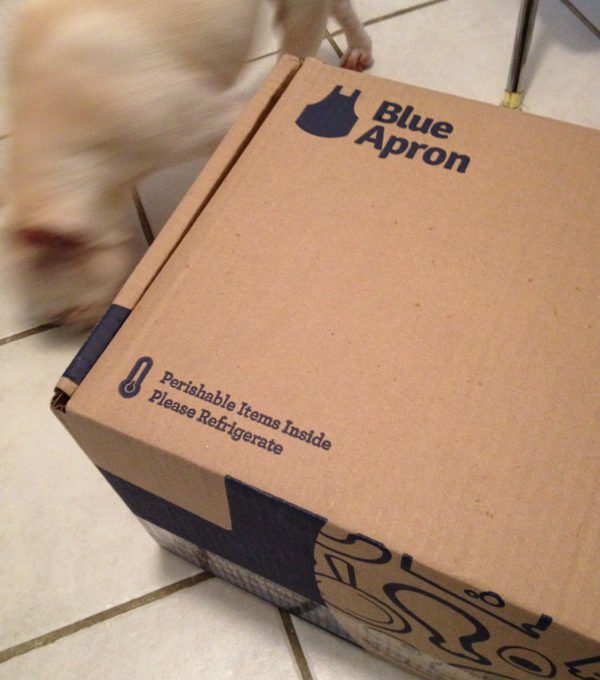 A Review of the Blue Apron Meal Delivery Service. Well, if you don’t, you probably aren’t reading Every Food Fits. (Unless you’re reading this because you’re my husband; thank you for supporting my passions, honey!) But I digress. In the kitchen, as in life, it’s always fun to try something new. Get out of your comfort zone. That’s why I recently signed up for a free trial for Blue Apron, a weekly (or on-demand) meal delivery service. The concept – and I’m drawing my own conclusion here based on my experience – is for people who love to cook and try new dishes, but don’t have the time or imagination to plan or shop for meals. Cost: $9.99 per person per meal. Everything you need – even all-purpose flour! – is in the box that’s delivered right to your door by FedEx (shipping is included in the price). The delivery box itself is a wonder to behold. There are layers of recyclable/reusable insulation within a cooler-sized box, and the proteins are nestled at the bottom with a serious honkin’ (that’s a technical term, by the way) ice pack. If I had room to store the box, I would’ve kept it as a cooler for a party, but I gave it away on Freecycle the next day, and the person who picked it up found the ice pack at the bottom was still cold! What’s far-and-away the best part about the service? Mise en place is done for you. That’s a valuable service in itself. Check out that mise en place! Our family of two adults and a toddler enjoyed three meals of two servings apiece, and each day we still had leftovers. We tried three meals: Chicken Wedge Salad with Crisp Apple, Walnuts and Lemon-Blue Cheese Dressing; Minute Steaks with Picadillo-Style Sauce; and Pan-Seared Cod with Soy-Maple Glaze, Baby Bok Choy & Rice Noodles. 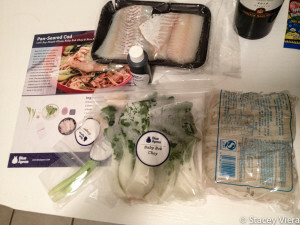 Pan-seared cod mise en place. 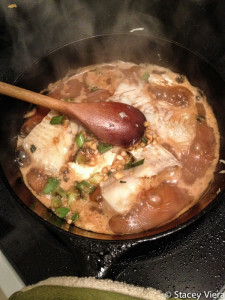 Cod cooking in cast iron. It doesn’t get much better than this. Finished cod dish. Sorry the photo isn’t prettier; I was hungry! 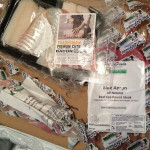 Blue Apron reintroduced us to cod. We usually stick to the basics – salmon, shrimp and canned tuna – when we shop for seafood. But reuniting with cod tasted so good. It’s firm, hearty and filling, yet doesn’t make you feel stuffed. The Pan-Seared Cod dish was our absolute favorite of the three. Recipe cards. We also loved the recipe cards containing calorie count information and the step-by-step instructions with photos. This is an excellent place to start for a novice home cook. Portioned food delivered to my door. I didn’t have to think about what to make for dinner or if I had all of the ingredients on hand. Blue Apron packaged it for me and portioned it out, too. This is a huge help when I have two kids under age 3 and a needy bulldog (figuratively) nipping at my heels. The cost. 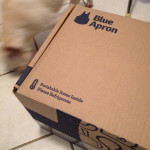 Is Blue Apron for every home cook? Not quite. For someone like me, an experienced cook who enjoys food shopping and plans recipes on a fairly strict budget, I can make these recipes less expensively. All of the recipes as presented. If you don’t feel comfortable modifying a recipe to suit your tastes, this could be a bit of a disaster. The calorie counts – 675 calories per serving for a salad?! – for certain dishes took me aback. We cut way back on the mayonnaise in the salad recipe, which would’ve been too schmaltzy for us as written, and it also cut many of the calories. 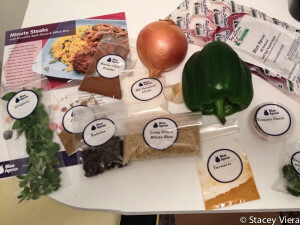 Overall, we loved the ease of the home delivery and mise en place offered by Blue Apron. Thank you for delivering many ingredients with which we wouldn’t usually cook and challenging us to try something different. 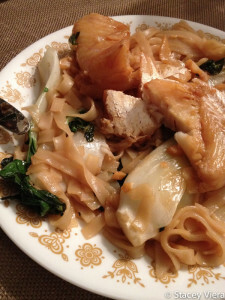 Have you tried Blue Apron or another meal delivery service? How about a local personal chef? Tell us how you cook at home! DISCLAIMER: My views about Blue Apron are mine and mine alone. A friend of a friend shared a coupon code for a free trial of Blue Apron. I was not compensated for this review. 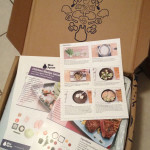 I’m so intrigued by Blue Apron! I’ve seen several bloggers try and I have to admit–I’m curious. It’s the price tag that’s kept me away. I usually try to keep our meals in the $3-4/serving range. For $10, I just figure we might as well grab Panera or Chipotle! Absolutely makes sense, Britt. Especially for a vegetarian! Great review, Stacey! I am totally intrigued by the concept, and I noticed that their recipes do seem to include some interesting ingredients that I’ve never seen at my epicurean grocery store… so that’s a point in their favor for an adventurous cook. But on the other hand, I was bewildered by the portions for their vegetarian recipes, which seemed really meager (for example, the bulk of a vegetarian dinner serving being half a sweet potato).